*Specific combinations of inputs and outputs can be active simultaneously. Refer to the schematic to determine possible I/O combinations. We call it CHRP ('chirp'). 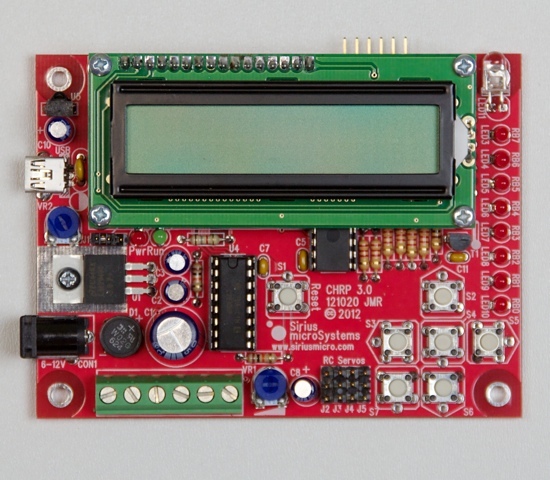 CHRP is a fully-featured microcontroller development system optimized for simple robotics applications. CHRP was created to help high school students learn about electronics and computer technology in a fun, hands-on way. CHRP also makes a great hardware and software training tool for introductory digital courses in college and university. CHRP is fully open, including its hardware design, software, and all of the CHRP resources and activities. What makes CHRP so special? CHRP was designed for learning, and for the classroom learning environment. It incorporates a power supply as well as analogue and digital circuitry to give students a wide base of electronics knowledge using just one project. CHRP is designed to be cost effective and can built in stages, enabling its capabilities to grow as students progress and providing level-appropriate challenges for each grade or semester (eg. grades 10-11-12, or introductory programming, interfacing, analogue techniques, etc.). Use the hands-on CHRP construction activities to learn about electronic parts and circuits as each section of the CHRP board is built and tested. Learn about resistors, capacitors, diodes, LEDs, power supplies, series circuits, and parallel circuits while exploring circuit characteristics using test equipment such as a multimeter and oscilloscope. CHRP includes a variety of built-in I/O circuits, chosen to represent a range of software skills and challenges, and is designed to be easily adaptable for line-following and basic robotics applications by using our simple CHRPbot robot base. Using pre-designed and tested I/O circuits enables students to focus on programming skills rather than spending time prototyping circuits on breadboards, or designing and building more complex mechanical robots. When you're ready to move past the basics, use CHRP as the embedded controller for different embedded projects, or as a development system for other embedded PICmicros. The versatility of the CHRP I/O enables data logging, user interface applications, alarm circuits, animatronics, remote control circuits, and more. And, since both CHRP's design and the MPLAB development tools are free, what you can do with it is only limited by your skills and imagination. These three different variations of the CHRP board correspond to the hardware requirements and software sophistication of the programming activities on the CHRP page - level 1, level 2, level 3. A CHRP printed circuit board and parts. You can buy a CHRP board from our products page. If you need many CHRP boards, download the CHRP Gerber files (above) and have your preferred pcb facility make them for you. Parts. All of the electronic components can be ordered from Digi-Key (www.digikey.com) using the part numbers in the CHRP parts spreadsheet (above). Tools - soldering iron, electronic solder, solder flux remover, needle-nose pliers, screwdrivers, and diagonal cutters. CHRP Activity 3.1 - Capacitor Filtering. Microchip's MPLAB-X or MPLAB 8 IDE (www.microchip.com). Microchip's PICkit-3 or PICkit-2 USB programmer/downloader, or a third-party programmer. A CHRP3 (of course! )—any of the three levels will work for the level 1 activities. Batteries, a wall adapter or a power supply to power the CHRP. Start by taking a look at the assembly code information. Next, make an assembly code project using the step in the MPLAB tutorial. Start by following the steps in the MPLAB X C tutorial.